Adam Lambert – Your Favorite Camp Counselor! You are here: Home / Adam in the Media / Adam Lambert – Your Favorite Camp Counselor! There are some changes to American Idol Season 13. Let’s start with how friendly the judging panel is. Except for a few artistic differences, returning judges Keith Urban, Jennifer Lopez and newcomer Harry Connick Jr. have rescued the show out of last year’s drama trashcan. Personally, I think they were too wishy-washy during pre-lims, giving some singers their Golden Ticket who would never have passed in Randy-Paula-Simon days. As they traveled around the country, the trio forgot they were judging contenders for the biggest talent show of all time, and didn’t weed out the goods from the greats. Harry Connick tried, but ran up against the Urban-J-Lo method of “I wanna hear more.” Until last night’s Hollywood Week. Upon exiting their LA-bound airplanes, Idol wanna-bees were rounded up and brought to a hanger. There, they discovered some of them will have to sing for their life. If they pass, they go to the hotel to unpack. If not, back on the plane, Jack! Auditions getting to this point ran pretty much status quo, except for not televising the William Hung-style contestants. You know, the ones just trying to get their 15 minutes of TV fame. The talent they sent to Hollywood was solid. Nothing that made me jump out of my seat or etch a “keep my eye on them” note in my memory. There’s only room for one of those, and we know who that was! Which brings me to Adam. American Idol Season 13 has started, and it didn’t take long before the show’s most exciting contestant’s name has been linked. 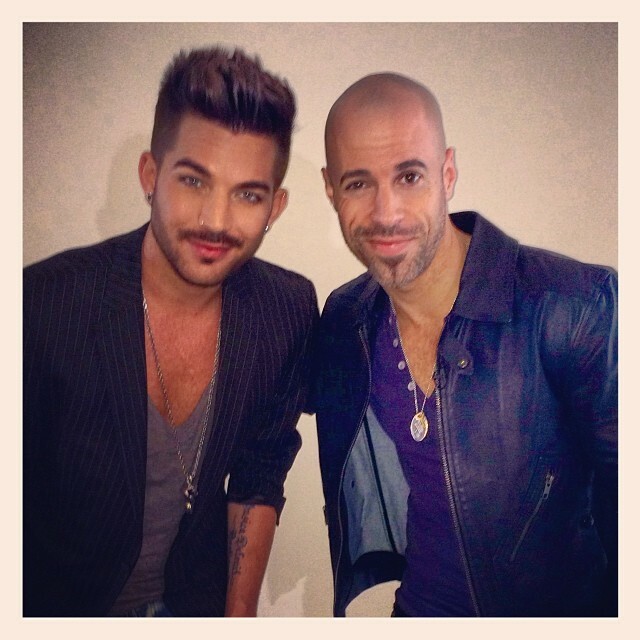 Did you catch the tweets from Chris Daughtry, talking about being at an Idol Workshop with Adam? I’ve learned that Randy Jackson is taking over the role of in-house mentor from Jimmy Iovine. He’s running a 2-day workshop for contestants who make it out of Hollywood Week and onto the live shows. According to TV Guide’s Hanh Nguyen, who was at Fox’s Television Critics Association winter previews with American Idol executive producer Trish Kinane, “Between Hollywood Week and the live shows, “Randy is going to be hosting a two-day workshop,” Kinane explained. During that time, the singers will go through extra education to work on song selection, their images and styles as artists, how to deal with emotional pressure and more aspects of performance. “Randy is very much putting this together, and that will carry through to the live shows,” Kinane said. For the rest of the article about changes to Idol, click here. So Glamberts, are you watching? Who’s your early picks? I watched it last night and I think making them dance takes away from their singing. This is a singing competition. It was sad that people had to practice choreography instead of singing. I really like the judges but the singing should be the first priority. I haven’t really watched AI since season 8 when they found Adam. Just can’t seem to find anyone who equals him. I like all the judges this year, but it has changed so since the days of Simon, Paula, Kara and Randy. Oh, for those good old days. Love the picture! These are two of my favorite singers. I can’t wait to see more. I will watch any episodes where Adam appears. This is great. IDOL knows there will never be another season like 8 when Adam graced the stage. Wait, they didn’t show the bad ones? No wonder no one was watching it at my house. It’s the only reason I started watching Idol!!! There was a girl in the auditions who was great & JLo liked her but both guys said No, & JLo said “You let a good one get away”. She got to sing on Ellen! I really liked her voice. I like Caleb (the long haired rocker guy), but NO ONE has ever blown my mind as much as Adam! Can’t wait to see him mentoring again! While many of the contestants chosen for this twist were reportedly the hopefuls who only got two out of the three judges to say “yes” during auditions, there were also a few that had garnered a unanimous vote. In other words, no one was safe from this twist. The singers who impressed the judges with their impromptu performances continued on while others were sent back home on what can only be considered the most heartbreaking whirlwind trip of their lives. Is it me or did Chris seem to critique more than Adam? I wanted to hear Adam advise them about their singing, their song choices, their stage presence, but he didn’t. I thought Chris did a much better job. Sorry Adam, but I still love you.